Just weeks after a father and son's attempt to rescue a baby bison that looked cold and stranded went horribly awry, Yellowstone National Park is back in the news for an unfortunate human-animal encounter. 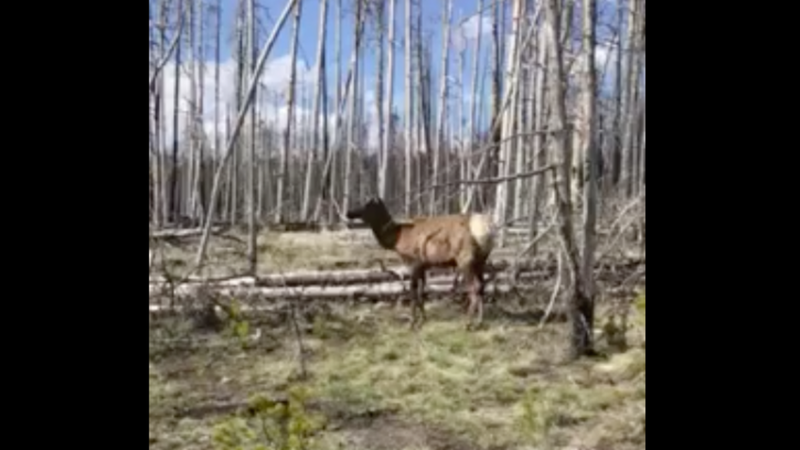 On Friday, a tourist was caught on video attempting to approach an elk for a photo—perhaps a selfie. A group of onlookers, including Jody Tibbitts, a tour guide with Jackson Hole Wildlife Safaris, attempted to warn the woman that she was far too close to the elk, but it was already too late. The elk had charged. The woman, who appears to be fine, ends up on the ground about a dozen feet back. The elk slowly turns away and continues about its business. According to Tibbitts, the elk had just given birth to a calf and was likely simply trying to protect her young. In any case, this was an entirely avoidable situation as tourists are required to remain 25 yards away from wildlife, not the 25 feet that the woman took the liberty of going for. Jeffrey Olson, a spokesman for the National Park Service, told ABC News that people hoping for a great photo can "endanger themselves and endanger wildlife." "People generally are just so excited to be in a park, and the next cool thing is if they can get a picture of wildlife, and then the third thing is 'Can I get a picture of me and the wildlife?'" he said. With the National Park Service celebrating its centennial this year and park visits at an all-time high, it's important to use humorous incidences like this as educational opportunities. Preserving nature in a way that allows for the kind of rich human interaction that national parks do requires an effort on the part of tourists to respect wildlife in a way they may not be used to. It has been shown time and again that taking selfies with animals can backfire. As tempting as it might be to get that perfect shot of yourself or your child with an adorable seal pup, please do the right thing and leave the seal pup alone. Getting too close to a wild animal puts you—and the animal—at risk. Seals have powerful jaws, and can leave a lasting impression. We have received reports of a number of injuries to humans as a result of getting too close to an animal during a quick photo op. When you get too close to a wild animal, you risk stressing or threatening it, and stressed animals are much more likely to act unpredictably. At the end of the elk video the woman appears to have learned her lesson, telling Tibbits that "it won't happen again." And that's called learning the hard way.